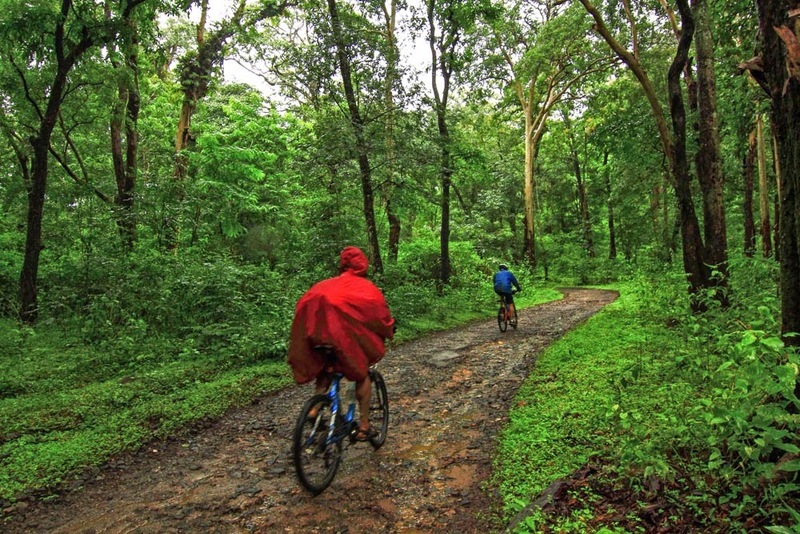 Cycling in the Lush Green Countryside of Coorg - Monsoons of Karnataka, In Pictures! ~ The Wandering Soul's Wander Tales..
Cycling in the Lush Green Countryside of Coorg - Monsoons of Karnataka, In Pictures! Ever since I moved to Bangalore in 2008 I made it a point to visit Western Ghats in monsoons, year after year, without fail! This year, I made two back to back trips in a week. [Things I can do now that I'm jobless! ;)]. In July, I first visited the lush jungles of KGudi where I also managed to sight a Tiger in wild. Over two days we saw as many vehicles as we count on fingers, no kidding! The route was through the lush green countryside of Kodava land. It rained on and off but when it rained it poured and it looked like those who cycled had the time of their lives. My friends did a recce few weeks before to finalize the route and went through several tiny villages. The kids of this particular village remember my friend Rajesh here, and were quite excited to see him! Between the dense forests, small patches of land were used for terrace cultivation. With it beautiful steps, red mud and lush green fields, it looked insanely beautiful when the clouds rolled in over from the mountains beyond. That's Mallali Falls in full flow surrounded by dense jungles at the foothills of Pushpagiri Mountain range. We walked to this falls in pouring rain late in the evening on day one as part of the ride. We drove, many rode along lush rice fields like this. Flooded and looking beautiful under a monsoon sky! Small streams and brooks were overflowing to the brim under the spell of a generous monsoon! Insane amount of greenery and awesomeness packed into two days. Pretty much shows how the ride over two days was - green, wet, misty and awesome! This is one of the many approaches to Harangi Backwaters. We walked along this muddy route to get to the waters but in reasonably dry season, makes for a good mountain biking route! Coffee Plantation workers using their traditional raincoats which work like a charm. A Plastic cover that's pointed over the top and stays on top of their head while they work in the farms. A part of the route also goes through lush coffee plantations. On the way, we encountered many such green and vast grasslands. These were fields that were yet to be sowed and were left empty till the rains subside for a while. But it was a great place to cycle and walk around! Last time I cycled in the rain in Madikeri, I enjoyed it the core. It was around the same area with but we did climb up and down a lot. In this ride however, the route was nice with nominal gradient and perfect for beginners. Beautiful countryside routes passing through dense forests, lush fields and brimming backwaters. I could talk more about how much I love monsoons but by now, you all probably know and it doesn't make sense to repeat the same old again. So, how did you enjoy this Monsoon Odyssey? My friends at TAG, (The Adventure Gypsies) have many more events planned for the monsoon, do join if you like getting off the beaten path. Have you done any monsoon trips so far? Let me know in the comments. Monsoons of Maharashtra - A Photo Essay of 1800+km Weekend Journey! Monsoons of Karnataka - A Wild Monsoon Outing to the Jungles of BR Hills! Overcast skies make everything look 10 times more beautiful. The pictures were so refreshing Neelima. I wonder how you are able travel even while being unwell !! awesome. i'm off to coorg in a month and hope it's still very green! The dark and misty skies make for wonderful pictures in the post Neelima. Coorg is indeed beautiful. Had been there last year. Absolutely loved it. Its a delight to get lost in the trees! Brilliant pictures! First one is the most tempting.. aah.. I had done a weeklong ride in the monsoon myself. That did some permanent changes in me :D You can read a summary here..
Where to get cycles in Coorg? ?